North Korea's foreign minister Ri Yong-ho assigns guilt to US President Donald Trump of declaring war on his country. North Korea's foreign minister Ri Yong-ho told reporters in NYC that his country has reserved the right to shoot down US bombers. This is not the first time that North Korea has used the phrase "a declaration of war" in relation to the United States. 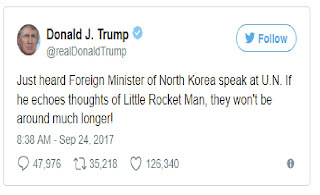 But Mr Ri's comments are a response to the US president's tweet that Mr Ri and North Korean leader Kim Jong-un would not "be around much longer" if they continued their rhetoric. 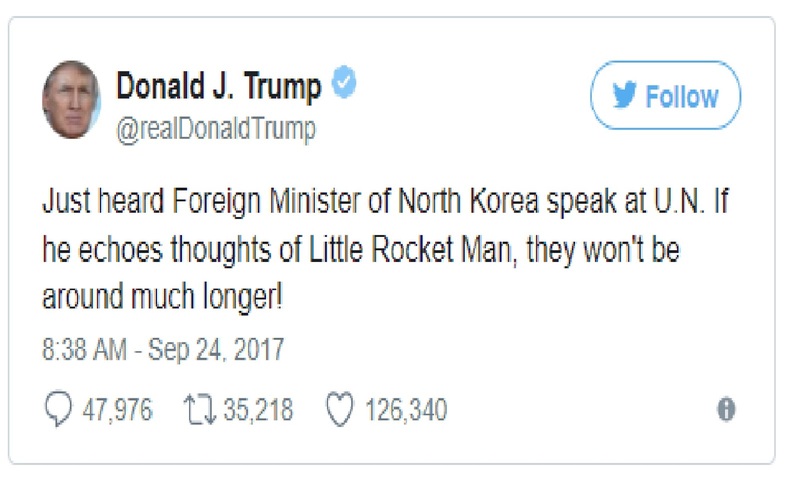 By hearing North Korea's foreign minister Ri Yong-ho speech Donald j. Trump Twitted in the social media.